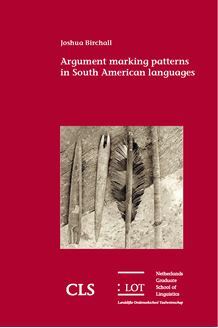 Argument marking patterns in South American languages South American indigenous languages show an incredible diversity in the ways that they mark arguments in independent clauses . This dissertation presents the first in - depth study of argument marking patterns in South America across a sample of 74 different languages . The languages are approached from a typological perspective and the major parameters of variation are encoded into a structural questionnaire . The study primarily focuses on verbal argument indexation , case marking and valency change . The different argument marking features are analyzed for the typological patterns that they display and also for their geographic distribution . The analysis presented in the study identifies a number of areal linguistic features for specific regions of the continent . The results suggest a significant East versus West distinction in the distribution of the argument marking features examined . This study contributes to our understanding of the linguistic diversity of South America and serves to highlight the different patterns that can be observed in the data .